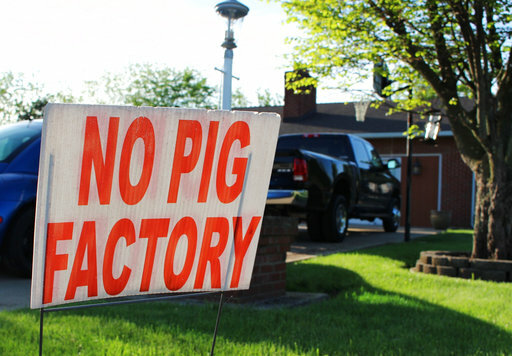 SALEM TOWNSHIP, PA (WSKG) — For several years, a hog farm in Luzerne County has been under legal fire for emitting a stench that people say can make the surrounding area almost unlivable. But the outlook isn’t good–and that’s largely because Pennsylvania law makes it near-impossible to sue farms for nuisances like smells. Will-O-Bett Farm’s hog feeding operation–which is causing the smell–began in 2013 in Salem Township. People living nearby sued in county court the following year, and the legal volleys have been ongoing since. Every state some form of Right to Farm law. Rusty Rumley, an attorney with the National Agricultural Law Center, said Pennsylvania’s is somewhere in the middle in terms of strictness. “Generally speaking, the more important agriculture is to a state’s economy, the stronger the Right to Farm protections will be,” he said. Republican state Representative and frequent farming advocate Mark Keller, of Cumberland County, acknowledged that can put farmers’ neighbors in a tough spot. But he said it’s a necessary tradeoff. “If we continue to push the agricultural industry out of Pennsylvania–or even the United States–then we end up importing our food products,” he said. Keller added, an underlying problem is farms being sold and turned into housing developments, which can lead to tension between the remaining farmers and their new neighbors. “There’s only so much land–you can’t make more of that. And, you know, the farms are taken and you’ve got one farm left amongst the development. That’s what creates the issue,” he said. He said he thinks there’s one potential solution, though: if more county governments participate in the commonwealth’s Agricultural Conservation Easement Purchase Program–under which they can purchase easements that guarantee farmland stays farmland–it could ultimately keep farms clustered, and away from neighborhoods. Pennsylvania already has the highest rate of farmland preservation nationwide.